My name is Eva and I have lived in Cascais for over 40 years. My Portuguese husband is the reason why I came to live in this wonderful country. I would like to share the history and heritage of Portugal with you, to enjoy discovering the stories behind history and bringing it all to life. This site offers some of my suggestions of where to go and what to see. Personalised tours for the discerning tourist can also be arranged. 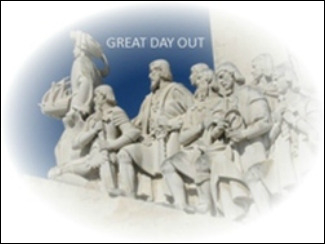 Get in touch to find out more about Great Day Out tours. The tours are tailor-made for those who want to get to know a little bit more about Portugal, without being overloaded with information, dates, names, etc. The aim is to make sure you get to see the sites and sounds of the local history without feeling like you're stuck in a history class at school.